Paul Cézanne’s preoccupation, and artistic experimentation, with how color modulates form is but a variant of the neurobiological question of how the separate representations of form and color are integrated in the brain to give us a unitary percept of both. The experiments of Picasso and Braque in the early, analytic, phase of cubism—of how a form maintains its identity in spite of wide variations in the context in which it is viewed—resolves itself scientifically into the neurobiological problem of form constancy. The quest of Piet Mondrian for the “constant truths concerning forms” is an artistic version of the question of what the neural building blocks of all forms are (often presumed to be the orientation-selective cells of the visual cortex), while kinetic art, which sought to represent motion artistically, reached conclusions that are consistent with conclusions reached later by neurobiology. 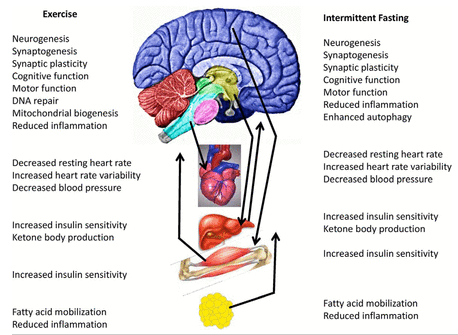 Exercise and IER/fasting exert complex integrated adaptive responses in the brain and peripheral tissues involved in energy metabolism. As described in the text, both exercise and IER enhance neuroplasticity and resistance of the brain to injury and disease. Some of the effects of exercise and IER on peripheral organs are mediated by the brain, including increased parasympathetic regulation of heart rate and increased insulin sensitivity of liver and muscle cells. In turn, peripheral tissues may respond to exercise and IER by producing factors that bolster neuronal bioenergetics and brain function. Examples include the following: mobilization of fatty acids in adipose cells and production of ketone bodies in the liver; production of muscle-derived neuroactive factors, such as irisin; and production of as yet unidentified neuroprotective “preconditioning factors.” Suppression of local inflammation in tissues throughout the body and the nervous system likely contributes to prevention and reversal of many different chronic disease processes. Douaud et al. characterize a common brain network linking development, aging, and vulnerability to disease. They show that the idea of brain decline mirroring brain development is correct. Analysis of structural brain images reveals that a network of mainly higher-order regions that develop relatively late during adolescence demonstrate accelerated degeneration in old age. Aging is accompanied by disruptive alterations in large-scale brain systems, such as the default mode network (DMN) and the associated hippocampus (HC) subsystem, which support higher cognitive functions. However, the exact form of DMN–HC alterations and concomitant memory deficits is largely unknown. We identified age-related decrements in resting-state functional connectivity of the cortical DMN, whereas elevated connectivity between the bilateral HC was found along with attenuated HC–cortical connectivity. Critically, elevated HC at rest restricts the degree to which HC interacts with other brain regions during memory tasks, and thus results in memory deficits. This study provides empirical evidence of how the relationship between the DMN and HC breaks down in aging and how such alterations underlie deficient mnemonic processing. Finally, Yotsumoto et al. find white matter in the older brain is more plastic than in the younger brain. Its changes during learning a visual perceptual task are not observed when younger subjects learn the same task. Following yesterday's post on changing gene expression with brain waves, I'll point to another bit of work on gene changing. Chemical changes to DNA, mainly methylation, can alter gene expression in response a number of environmental changes such as stress, diet, and pollutants. Reynolds points to work by Lindholm et al. now showing that exercise activates health enhancing genes by this epigenetic mechanism. They use the simple trick of measuring and comparing methylation of DNA in exercised and unexercised legs of single individuals (twentythree young subjects bicycled using only one leg, leaving the other unexercised, for three months. The pedaling was at a moderate pace for 45 min, four times per week for three months.) Not surprisingly, the exercised leg was more powerful, but in addition more than 5,000 sites on the genome of muscle cells from the exercised leg now featured new methylation patterns. This work makes me wish I had a home kit for detecting methylation change in the DNA of my thumb muscles, which show dramatic changes in strength and size depending on how often and energetically I practice the piano. How does learning to read affect visual processing? We addressed this issue by scanning adults who could not attend school during childhood and either remained illiterate or acquired partial literacy during adulthood (ex-illiterates). By recording event-related brain responses, we obtained a high-temporal resolution description of how illiterate and literate adults differ in terms of early visual responses. The results show that learning to read dramatically enhances the magnitude, precision, and invariance of early visual coding, within 200 ms of stimulus onset, and also enhances later neural activity. Literacy effects were found not only for the expected category of expertise (letter strings), but also extended to other visual stimuli, confirming the benefits of literacy on early visual processing. Cross-species evidence that adaptive training diminishes distractibility in Aging. Aging is associated with deficits in the ability to ignore distractions, which has not yet been remediated by any neurotherapeutic approach. Here, in parallel auditory experiments with older rats and humans, we evaluated a targeted cognitive training approach that adaptively manipulated distractor challenge. Training resulted in enhanced discrimination abilities in the setting of irrelevant information in both species that was driven by selectively diminished distraction-related errors. 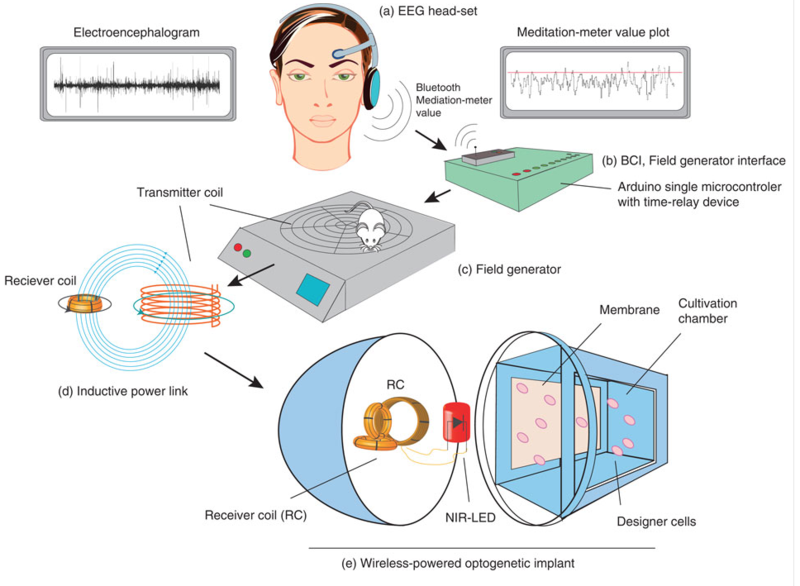 Neural responses to distractors in auditory cortex were selectively reduced in both species, mimicking the behavioral effects. Sensory receptive fields in trained rats exhibited improved spectral and spatial selectivity. Frontal theta measures of top-down engagement with distractors were selectively restrained in trained humans. Finally, training gains generalized to group and individual level benefits in aspects of working memory and sustained attention. Thus, we demonstrate converging cross-species evidence for training-induced selective plasticity of distractor processing at multiple neural scales, benefitting distractor suppression and cognitive control. How to bridge the respective bubbles of our ideological tribes? A number of recent mindblog posts have engaged the issue of the individual versus the collective good (for example, here, here, and here), a creative tension that has been central in human evolution. This has led me to mull a bit about the current apparent drift in the direction of more extreme individualism and rejection of the state’s concern for common interests. I sometimes feel guilty for not being more evangelistic about promoting a rational scientific ideology that encompasses creationists, conservatives, and libertarians in a more broad evolutionary view, I wonder how it might be possible to induce these groups to admit a broader swath of reality than they currently seem willing to engage. Concrete personal steps I might take? The expression of my ideas or those of others in writing is relatively easy, that is what this blog is about. The problem is that MindBlog exists as one instance in the array of similarly minded sites that largely mirror each other’s views. I suspect that it is quite invisible to those following websites that deal with Creationism , conservatism, the libertarian or tea party movements that extoll individualism, etc. Those sites, in turn, are unlikely to be viewed by followers of atheist, agnostic, skeptic, or humanist sites more sympathetic to collective views of the individual in society. I do hope that the a devout creationist or extreme individualist who occasionally stumbles on to a MindBlog post has his or her mental horizons slightly expanded. I wanted to pass on to MindBlog readers this item analyzing the paper noted in my recent post "Banking - a culture of dishonesty", Statistician Salil Mehta argues that the article is misleading, missing data, and mathematically inaccurate. Several nuggets on the individual vs. the collective. Following yesterday's post on the evolution of prosocial religions, I pass on a random set of links to articles also relevant to the individual and the collective. Terrell notes that the current political schism between Republicans and Democrats has a foundation in different views about the whether an individual's primary purpose is to look out for communal or self interests. ...modern evolutionary research, anthropology, cognitive psychology and neuroscience have come down on the side of the philosophers who have argued that the basic unit of human social life is not and never has been the selfish, self-serving individual. Contrary to libertarian and Tea Party rhetoric, evolution has made us a powerfully social species, so much so that the essential precondition of human survival is and always has been the individual plus his or her relationships with others. Luhrman does a piece "Wheat people versus rice people" which references the same work mentioned in MindBlog's May 21st post, and notes several other studies on individualistic versus collective cultures. Finally Crockett et al. do an experiment relevant to social cohesion, showing that harm to others outweighs harm to self in moral decision making - most people sacrifice more money to reduce a stranger’s pain than their own pain (the pain being delivered by electric shocks). In an increasingly aging society, age has become a foundational dimension of social grouping broadly targeted by advertising and governmental policies. However, perception of old age induces mainly strong negative social biases. To characterize their cognitive and perceptual foundations, we modeled the mental representations of faces associated with three age groups (young age, middle age, and old age), in younger and older participants. We then validated the accuracy of each mental representation of age with independent validators. Using statistical image processing, we identified the features of mental representations that predict perceived age. Here, we show that whereas younger people mentally dichotomize aging into two groups, themselves (younger) and others (older), older participants faithfully represent the features of young age, middle age, and old age, with richer representations of all considered ages. Our results demonstrate that, contrary to popular public belief, older minds depict socially relevant information more accurately than their younger counterparts. It is not controversial that neurons do playful things. They deploy themselves somewhat haphazardly in glial matter, exhibiting no lateral crystalline order. They arborize with each other in ways that resemble tree branches and roots. They possess on-board memory that responds to incoming signals in an agent-based way and changes the signals they themselves generate. If we suspend disbelief for a moment and consider the possibility that play might be a design principle rather than a higher emergent phenomenon, a simple idea presents itself as to why making sense of the connectome might be so difficult. The latter includes things like obtaining the entire map of C. elegans and finding that it still doesn’t make any sense, and that it even has no action potentials. It is a small step from systems that play without direction to systems that play with rules, and from there to systems that play games with each other. Were that to happen, it could easily account for something as complicated as the brain, for it is well known from the study of automata that simple systems playing games can create enormously complex structures with very sophisticated functions. It is also known that small changes in the rule base can make enormous changes in the structures that develop. There is also the obvious example of the human economy, a thing that grows out of simple rules of money exchange that transcends anyone’s attempt to understand and manage it. One of the economy’s physical manifestations is a great network of highways with mighty cities at its hubs. It would obviously be a fool’s errand to try understanding the economy by mapping its roads. There is nothing supernatural or unscientific in the concept of gaming making a brain, or for that matter an entire organism. All that is required is an intermediate stage of organization that is unstable, like the weather. Physical science tells us that unstable development can be perfectly deterministic yet difficult, if not impossible, to follow by experiment, among other reasons because unstable evolution is functionally the same thing as cryptography. Thus the scientific resolution of the whole mystery might simply be that the genome instructs the system to go wild and generate a bag of tools and parts it might need to construct something interesting, and then sends a subsequent instruction to go out and play. Emergent self-organization then finishes the job. Petri et al. show that "the brain's functional patterns undergoes a dramatic change post-psilocybin, characterized by the appearance of many transient structures of low stability and of a small number of persistent ones that are not observed in the case of placebo." A simple reading of their results is that the effect of psilocybin is to relax constraints on brain function, ascribing cognition a more flexible quality. This may account for the transient synesthesia reported by many with psilocybin, hearing colors or seeing sounds. When ingested, psilocybin metabolizes to psilocin, which resembles the chemical structure of serotonin — a neurotransmitter that regulates mood, appetite, sleep, cognitive functions like memory and learning and feelings of pleasure. Psilocin may simulate serotonin, and stimulate serotonin receptors in the brain...psilocybin therapy could be useful in treating disorders like depression, in which people get stuck in a spiral of negative thoughts. Like electric shock therapy, psilocybin might act like tripping a circuit breaker or rebooting your computer. The Bone review also give links to studies on psilocybin effects on other psychological syndromes. We search for meaning at the start of each chronological decade. ...people audit the meaningfulness of their lives as they approach a new decade in chronological age, further suggesting that people across dozens of countries and cultures are prone to making significant decisions as they approach each new decade...Six studies show that adults undertake a search for existential meaning when they approach a new decade in age (e.g., at ages 29, 39, 49, etc.) or imagine entering a new epoch, which leads them to behave in ways that suggest an ongoing or failed search for meaning (e.g., by exercising more vigorously, seeking extramarital affairs, or choosing to end their lives). Under scarcity, you devote a lot of resources to the thing you’re lacking...When people are juggling time, they are doing something very similar to when they’re juggling finances. It is all scarcity juggling. You borrow from tomorrow, and tomorrow you have less time than you have today, and tomorrow becomes more costly. It’s a very costly loan. When you get overloaded and you feel this deadline is overwhelming, you can say, I’ll take a vacation, I’ll focus on work-life balance...Poor people can’t say, ‘I’ll take a vacation from being poor.’ It’s the same mental process, but a different feedback loop.The poor are under a deadline that never lifts, pressure that can’t be relieved. If I am poor, I work or I churn until decisions like buying lottery tickets begin to seem like attractive alternatives. I lack the time to calculate the odds and think of alternative uses for my money...the mental bandwidth tax is powerful enough to make the overall problem run deeper. The poor... are so taxed they don’t even realize they have a problem...AND of course how much money you have affects how much time you have. If you keep busyness constant, the rich have it much easier...they can buy nannies and drivers and lawyers and the like. It’s easy to give yourself time if you have money. If poverty is about time and mental bandwidth as well as money, how does this change how we combat its effects? When we think about programs for the poor, we don’t ever think, hey, let’s give them programs that don’t use a lot of bandwidth...Instead, we fault people for failing to sign up for programs that are ostensibly available, even though we don’t factor in the time and cognitive capacity they need to get past even the first step...Take something like the Fafsa” — the Free Application for Federal Student Aid — Why is pickup for the low-income families less than 30 percent? People are already overwhelmed, and you go and give them an incredibly complicated form...One study found that if you offer help with filling out the Fafsa form, pickup goes up significantly. The peripheral immune system and stress susceptibility. Using a social stress model in mice, Hoades et al. find preexisting individual differences in the sensitivity of the peripheral immune system that predict and promote vulnerability to social stress. Finding that the emotional response to stress can be generated or blocked outside the brain suggest a new route for treating stress disorders, perhaps by controlling the peripheral level of the cytokine IL-6. Depression and anxiety have been linked to increased inflammation. However, we do not know if inflammatory status predates onset of disease or whether it contributes to depression symptomatology. We report preexisting individual differences in the peripheral immune system that predict and promote stress susceptibility. Replacing a stress-naive animal’s peripheral immune system with that of a stressed animal increases susceptibility to social stress including repeated social defeat stress (RSDS) and witness defeat (a purely emotional form of social stress). Depleting the cytokine IL-6 from the whole body or just from leukocytes promotes resilience, as does sequestering IL-6 outside of the brain. These studies demonstrate that the emotional response to stress can be generated or blocked in the periphery, and offer a potential new form of treatment for stress disorders. Depression and anxiety disorders are associated with increased release of peripheral cytokines; however, their functional relevance remains unknown. Using a social stress model in mice, we find preexisting individual differences in the sensitivity of the peripheral immune system that predict and promote vulnerability to social stress. Cytokine profiles were obtained 20 min after the first social stress exposure. Of the cytokines regulated by stress, IL-6 was most highly up-regulated only in mice that ultimately developed a susceptible behavioral phenotype following a subsequent chronic stress, and levels remained elevated for at least 1 mo. We confirmed a similar elevation of serum IL-6 in two separate cohorts of patients with treatment-resistant major depressive disorder. Before any physical contact in mice, we observed individual differences in IL-6 levels from ex vivo stimulated leukocytes that predict susceptibility versus resilience to a subsequent stressor. To shift the sensitivity of the peripheral immune system to a pro- or antidepressant state, bone marrow (BM) chimeras were generated by transplanting hematopoietic progenitor cells from stress-susceptible mice releasing high IL-6 or from IL-6 knockout (IL-6−/−) mice. Stress-susceptible BM chimeras exhibited increased social avoidance behavior after exposure to either subthreshold repeated social defeat stress (RSDS) or a purely emotional stressor termed witness defeat. IL-6−/− BM chimeric and IL-6−/− mice, as well as those treated with a systemic IL-6 monoclonal antibody, were resilient to social stress. These data establish that preexisting differences in stress-responsive IL-6 release from BM-derived leukocytes functionally contribute to social stress-induced behavioral abnormalities.